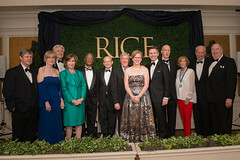 The Laureates Awards Program was created by the Association of Rice Alumni in 1937 to recognize highly distinguished individuals for extraordinary achievements and contributions to their professions, local communities and Rice University. Every year, three major awards celebrate outstanding Rice alumni and friends of the university, including the Meritorious Service Award, the Distinguished Alumni Award and the Gold Medal, the highest possible honor for service to the university. The 2019 Laureates Awards honorees will be recognized at the Laureates Awards Dinner, May 11, at the River Oaks Country Club. The special evening will include a reception with the honorees, a formal dinner and awards ceremony, and a champagne and dessert reception. Click here to read about the 2019 Laureates Awards Honorees. The highest award presented by the Association of Rice Alumni, the Gold Medal recognizes those who have rendered extraordinary service to the university. Each recipient must demonstrate one or more of the following criteria: outstanding service in promoting the ideals of the founders of the university, exceptionally deep dedication to and advancement of the academic excellence of the university, or uncommon generosity of time and means in support of the university. Although preference is given to living nominees, posthumous nominations also are accepted. Submit a nomination for the Gold Medal Award. This award is presented to alumni who have advanced the interests and standards of excellence of Rice University through distinctive professional or volunteer careers. It is reserved for those who attended the university as an undergraduate or graduate student for a period of at least one year and are living at the time of consideration. No one who has received the Gold Medal may subsequently be awarded the Distinguished Alumni Award. Submit a nomination for the Distinguished Alumni Award. This award recognizes those who have made significant, sustained and voluntary contributions of energy, time and creativity toward the advancement of the university. Alumni, active or retired faculty, staff, administrators and friends of Rice who are living at the time of their selection are eligible. No one who has received the Gold Medal may subsequently be awarded the Meritorious Service Award. Submit a nomination for the Meritorious Service Award.